Treating digestive disorders with acupuncture, herbs and good nutrition is one of my specialties. Call me a nerd, but the human gastrointestinal tract is a source of endless fascination for me. Check out these interesting facts I’ve learned about it along the way! 1. Your digestive system actually has its own nervous system. 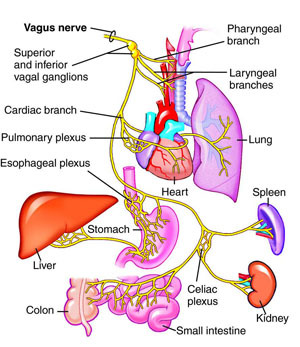 Called the enteric nervous system, it communicates complex information to the Central Nervous System via a very long and wandering nerve called the Vagus Nerve. 2. Your body contains more foreign DNA than your own DNA because of the diverse number of microbes that live in your gut. This population of gut flora is collectively called the microbiome and it is responsible for very important functions like manufacturing vitamins, fighting off infection and maintaining the integrity of your gut lining. 3. Approximately 80% of the neurotransmitter serotonin – responsible for stimulating gastric motility and mood regulation – is actually made in your gut. 4. If you were to take the entire GI tract and lay it flat, the surface area would be roughly the size of a tennis court! This allows for maximum absorption of nutrients and fluid.